The Big Marley Trail is the perfect track for family with young children. It is a grade 2 track with some gentle hill section and occasional steps. Autumn is a great season for bush walking, the weather is not ridiculously hot and it is not too cold with gusty winds. This 8 km return track follows the fire trail from Bundeena Drive to the Marley Head lookout, showcasing spectacular coastal sandstone escarpment vistas and golden beaches below. My four-year-old son walked most of the track on his own at his leisurely pace, jumping puddles collected from the running stream, picking up rocks and throwing them into the bush and heath. For the bird lovers, look out for the Spotted Paradalote – a distinctly bright yellow breasted bird, so tiny and swift swooping across the track weaving in and out of the trees. About midway to the Marley Lookout on your left, through the tree branches and above the heath, you can make out the hazy city skyline in the distance on the other side of the Port Hacking. Just a little further, subtly climbing up an incline, the horizon widens and the expanse of the pacific ocean appears miraculously and a jolt of excitement invigorates you to rush to the destination to soak in the view – well rewarded after walking 4km. If you are keen and still have energy, take a 10-minute detour (north) via The Coast Track to see the Wedding Cake Rock. 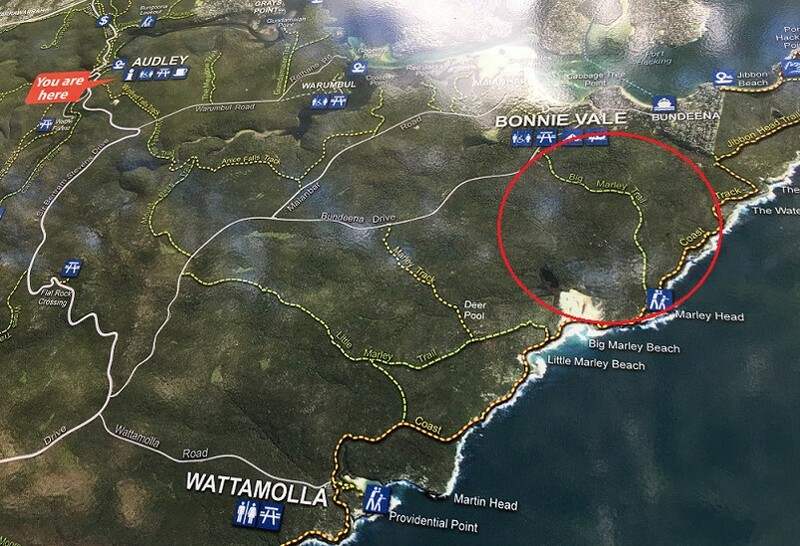 The trail is located off Bundeena Drive just a short distance before the Bonnie Vale picnic area. Follow the fire trail tracks for 4km to Marley Head Lookout. Note: Make sure you purchase the National Parks Entry Fee ($12 day pass) and display the ticket on your car dashboard. The fine for non-payment is $120. Payments can be made at Audley or Bonnievale. When: Royal National National Park is open 7am to 8.30pm but may have to close at times due to poor weather or fire danger. I've done this walk and you have captured it really nicely with your photos.